What if you didn’t need extra apps and instgram or snapchat filters to get that perfect selfie? What if there was a product that you could use that would give you skin that could rival Alicia Keys makeup free selfies? Or the glowing skin of your favorite posh spice girl Victoria Beckham? Celebrity beauty routines are usually the result of several elements: intense workouts, nutritious foods, rare spa treatments and cult beauty products. However what if all you needed was lots of water, beauty sleep and The Lancer Method? 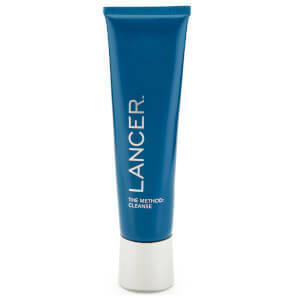 The Lancer Skincare product range was exclusively designed for Dr. Harold Lancers Rodeo Drive clientele, such as Beyonce and Kim Kardashian for in-between treatments but after a 2011 appearance on the Oprah Winfrey show, Dr. Lancer couldn’t keep this secret to himself any longer and decided to extend the line to the public! 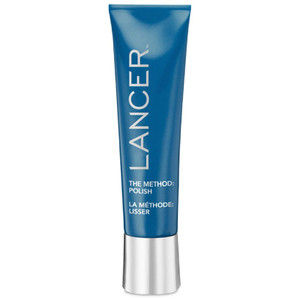 The Lancer Method involves a trio of technologically advanced game-changing skin care products that work synergistically and help your skin rediscover its youthful capacity. So when I was sent these products to try complimentary from Influenster and Sephora, if the celebrity mojo wasn’t enough to convince me to try it, my momma always said to start the anti aging process BEFORE you start aging….lol so I’m alllll about anti aging products and getting a jump on a mid life skin crisis. It allllll starts with The Polish. What they say: The Polish invigorates the skin cells in just the right way, with nano mineral crystals and pomegranate enzymes that release awarming element when used. The polish triggers cellular regeneration by ‘tricking’ the skin into thinking it’s been injured. The texture of the skin is dramatically resurfaced and refined after one use. Revealing a fresher younger-looking glow. These crystals don’t really damage the skin. With The Polish, you’re in control, and you actively encourage your skin to renew itself. My Initial Thoughts: The polish was niceeeeee, the exfoliating crystals were a-plenty but not so harsh that my skin felt damaged. It almost felt like using baking soda to exfoliate. Gentle but effective. My Initial Thoughts: I felt it was a basic cleanser. It didn’t feel like anything extraordinary but it got the job done. My skin didn’t feel over cleaned, dry or tight after using which was a plus. The Lancer polish is remarkable, but the moisturizer is everryyyttthinggg and more! What they say: The final step in the Lancer Method, Nourish is a a potent, peptide-rich, antiaging treatment which delivers important nutrients and antioxidants to the skin, promoting a healthy glow and supports the skin’s natural cell function It delivers vital hydration with hyaluronic acid and hexapeptide-48 and helps improve the looks of fine lines, wrinkles, texture and firmness. My Initial Thoughts: This moisturizer just felt nourishing. Very thick and rich my skin felt instantly silky and hydrated. A little goes a long way and my skin felt moisturized all day long. Skin is plump baby, plump! What they say: For brighter eyes, finish with the Eye Contour Lifting Cream, a triple-acting eye treatment formulated with diamond powder for a brighter, firmer, softer, younger-looking glow. Formulated with an emollient blend of time released hyaluronic acid, peptides and caffeine. The eye cream targets dark circles, wrinkles and puffiness. If you want to try it for yourself click here! 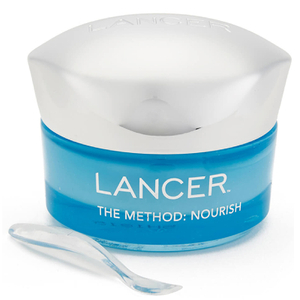 * The Lancer Method is optimized for all skin types.